Indian skipper Sourav Ganguly today expressed his doubt on how effective Kapil Dev would be in coaching the bowlers at the three-day conditioning camp here before the team leaves for Pakistan. India will carry the intensity with which they played in the recent Test matches against Australia into the Pakistan series this month, vice-captain Rahul Dravid said here today. After missing the bus for the one-dayers, a desperate Anil Kumble is leaving no stone unturned to become fully fit for the Test series against Pakistan. Kumble, nursing a shoulder injury, had to be left out of the 15-member Indian squad for the five-match one-day series beginning on March 13 after he failed to prove his fitness. For any other player the five-day Duleep Trophy final between North Zone and East Zone scheduled to get under way at the PCA Stadium at Mohali tomorrow will be any other contest. Comeback paceman Glenn McGrath is hopeful of a late call-up for Australia’s three-Test cricket series in Sri Lanka and is aiming to prove his fitness playing for New South Wales here tomorrow. If coach Rajinder Singh was hard pressed to explain India’s 1-1 draw with Belgium yesterday in their opening pool game of the men’s Olympic Hockey Qualifying Tournament, then it only highlighted the mystery of the team’s inconsistent performance. The Indian colts survived a minor scare before roaring back to subdue Malaysia 4-2 and record their second consecutive victory in the four-match hockey ‘Test’ series at the Shivaji Stadium here today. On a day of two upsets when qualifier Tai Wei Liu of Taipei stole the limelight by defeating fourth seed Alexey Kedriouk of Kazakhstan 7-6 (7-4), 1-6, 6-4 and unseeded Egyptian Karim Maamoun ousted seventh seed Indonesian Febi Widhiyanto 6-4, 6-4, two Indians — eight seed Sunil Kumar Sipaeya and Vishal Uppal — entered the quarterfinals of the ITF Futures tennis championships here today. Corps of Engineers rowed into the finals of all the events on the third day of the 24th Open National Rowing Championship at the Sukhna Lake today. Karnataka's Mahesh G, Antony H, Siju Thomas and Parveen Singh, who entered the final of the men's light coxless fours event on the third day of the 24th Open National Rowing Championship at Sukhna Lake, Chandigarh, on Wednesday. South Eastern Railway Kolkata in group A, Western Railway Mumbai in group B, South Central Railway Secundrabad in group C, Eastern Railway Kolkata and Rail Coach Factory in group D have qualified for the quarterfinal in the 60th All India Railway Football championship being played at Rail Coach factory stadium here today. Five cricketers, including district president of the cricket association Vikas Thakur, were seriously injured when stair case of cricket dressingroom at Luhnu Ground caved in all of sudden this afternoon. The Indian team will have a three-day camp starting March 7 where Kapil Dev will train the fast bowlers as bowling consultant. “Kapil has vast experience and he can share his idea and the clinic can be effective in the long run,’’ Sourav, however, clarified. “Both of them played very well in Australia. Bad luck they couldn’t make it to Pakistan. But we can accommodate only 15 players. And the best have been picked,” he said. Ganguly said the 15-member Indian team selected for the coming one-day cricket engagements in Pakistan was the best available in the country, but conceded that the absence of leggie Anil Kumble and pacer Ajit Agarkar would be felt. “Both of them are outstanding players... among the best in the world... so their absence will be felt,” Ganguly said about the injured duo, who are ruled out of the five-match one day series beginning in Karachi from March 13. “But what can be done? Both of them are injured. And there is too short a gap between our recent tour to Australia and coming engagement in Pakistan for them to recover in time,” Ganguly told reporters here after a gym session. He hoped that both the players would be fit before the three-Test series which would follow the one-dayers. “But the side that has been picked up comprises the best in the country now,” he said. Ganguly also hoped that seamer Ashish Nehra would be able to prove his match fitness in the Duleep Trophy final which the board has advised him to play. “The fact that we played some good, intense cricket in Australia will work to our advantage in Pakistan. 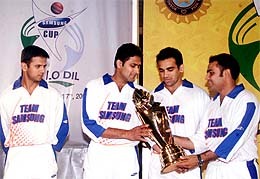 We want to take the intensity on to the Pakistan series,” Dravid told reporters here after the unveiling of the Samsung Cup, the trophy for the India-Pakistan one-day series. The stylish right-handed batsman said although he did not have any specific preference regarding the one-dayers being held before or after the Tests, he was pleased that India would be playing the shorter version of the game first in Pakistan. “This will allow our bowlers who are injured to regain fitness,” said Dravid, dressed in Samsung colours and accompanied by his other team-mates — Anil Kumble, Virender Sehwag and Zaheer Khan. India will leave for Pakistan on March 10 to play five one-day matches followed by three Tests. The Indian vice-captain did not agree that the current series should be billed as a contest between “our batsmen vs their bowlers”. 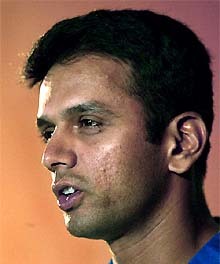 Dravid said the topic of whether he liked to double up as a wicketkeeper had now become “stale”. Brushing aside suggestions that the team might find it difficult to adjust to the slow wickets in Pakistan after playing on bouncy Aussie wickets, he said “I don’t think all wickets in Pakistan are slow. The last series between South Africa and Pakistan was played on bouncy wickets. Dravid refused to be drawn into the debate whether India needed a regular bowling coach who could accompany them to various tours abroad. After missing the bus for the one-dayers, a desperate Anil Kumble is leaving no stone unturned to become fully fit for the Test series against Pakistan. Kumble, nursing a shoulder injury, had to be left out of the 15-member Indian squad for the five-match one-day series beginning on March 13 after he failed to prove his fitness. “I am not fully fit now but should be fit for the Test matches which I want to play very much,” Kumble told reporters at a function held here to unveil the Samsung Cup, the trophy for the India-Pakistan one-day series. Kumble agreed that for a spinner it would be a challenge to rein in the Pakistani batsmen. For any other player the five-day Duleep Trophy final between North Zone and East Zone scheduled to get under way at the PCA Stadium at Mohali tomorrow will be any other contest. They will play with the same vigour and enthusiasm as they do in any other game. But not Ashish Nehra. As per the directive issued by Mr Jagmohan Dalmiya, the BCCI president, Nehra must play and prove himself match fit if he has to be part of the Indian one-day squad for the historic trip to Pakistan. It would be tough for Nehra as the left-arm swing bowler has not played any competitive cricket ever since he returned from Australian tour, where also he remained a spectator for a major part of the series. Nehra was not there at the nets in the morning session when players of both the teams warned up. Nehra, who arrived later in the afternoon, did bowl at the nets in the evening along with Gagandeep, Sarandeep and others. Devang Gandhi, the East Zone, captain looked unperturbed by the strip, which has a fair bit of grass on it being used for the match as his players went through batting and fielding drills. “We played our last game also on the wicket which was quite green. Moreover, we have the seam attack to exploit the conditions,” he said confidently. Gandhi, who was part of the Indian squad which visited Australia four years back and played there as an opener, was satisfied with his team’s performance. “We have been playing well as a team, particularly after the Deodhar Trophy matches. 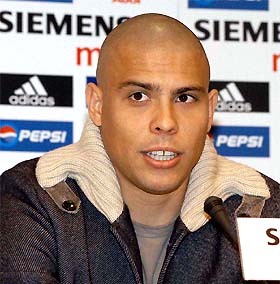 The team spirit is excellent and the players are eager to perform,” he revealed. He praised new ball bowler S.S. Paul who harried the England A batsmen in the previous game and completed a well-deserved five-wicket haul. Paul is in good form and has taken 45-odd wickets in the previous seven games. The bowling attack will also have former India seamer Debashish Mohanty, considered a natural swing bowler. In Mohanty and Paul East Zone have the potent new-ball pair which can be quite a handful for their rivals. Off-spinner Sourasish Lahiri has also been bowling well. East Zone are being well served by former India opener Shiv Sunder Das, who has two crucial century knocks against South Zone and England A under his belt. The return of Rohan Gavaskar, who did well in one-day matches in Australia, will strengthen the squad. Gandhi, Deep Dasgupta, Arindam Das and all rounder Laxmi Rattan Shukla make East Zone a well-balanced squad. Dinesh Mongia, skipper of North Zone, hinted at the possibility of going with a four-pronged seam attack in view of the arrival of Nehra. “Bhandari, Gagandeep and Joginder in the seam department and Sarandeep and myself as spinners have done well so far,” he said. “On paper we have a very strong batting line-up. We have not clicked together in any game so far. I hope it happens here,” he said. The toss will be crucial in view of the green top and the skipper who calls correct would like to see his seamers exploit the conditions first . East Zone: Devang Gandhi (captain), S S Das, Rohan Gavaskar, Arindam Das, Deep Dasgupta, Laxmi Ratan Shukla, Utpal Chatterjee, Sourasish Lahiri, S S Paul, Mahendra Singh Doni, Rajeev Kumar, Debashish Mohanty, Vasant Sarvanan and C Sachdeva. North Zone: Dinesh Mongia (captain), Akash Chopra, Gautam Gambhir, Mithun Minhas, Yuvraj Singh, Ajay Ratra, Joginder Sharma, Sarandeep Singh, Gagandeep Singh, Amit Bhandari, Vishal Bhatia, Sangram Singh, Pankaj Dharmani and Fazil Mohammad. The 34-year-old Australian Test spearhead is playing his way back after a seven-month lay-off because of ankle problems. McGrath had figures of 6-56 off 32.3 overs and 4-30 off 18 overs in NSW second XI’s nine-wicket win over Victoria in Melbourne last week. McGrath admits he wants to prove he’s in good enough form to be ushered into the current Sri Lankan Test tour if one of the fast bowlers breaks down. 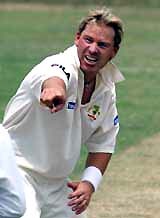 “I’m bowling better than even before the last Ashes series,” said McGrath, whose last Test was against Bangladesh in Cairns last July. “The game I played in Melbourne last week was the best I’ve felt for years. Besides, the usual offerings of “missed chances” from the coach, he did make a pertinent point about the two incidents that apparently distracted the Indian team when leading 1-0 with about nine minutes remaining. The green card to Vikram Pillay in the 50th minute, followed by the sending out of Baljit Singh Dhillon in the 64th somewhat unsettled the team. Dhillon’s suspension reduced the Indian team to 10 men and the Belgians swiftly launched a counter-attack that eventually culminated in the equaliser in the 65th. “I thought Dhillon’s suspension came about at the wrong time from India’s point of view and when we needed to at least maintain our advantage, we fell back to concede the equaliser. We need to tighten up our play in the final minutes,” said Rajinder while reflecting on the lung-opener. Next up against India tomorrow are Malaysia who went down 0-1 to New Zealand. Thus, tomorrow’s game will be crucial for both the teams. The Malaysians have been difficult opponents in recent times and the contest between the two has generally been touch and go. Having watched part of Malaysia’s game against New Zealand, the Indians must surely be feeling confident of the upcoming match. Lissek, under tremendous pressure to achieve results, felt that the game against India tomorrow would be extremely difficult and that his team needs to be on top of things to pull off a victory that they desperately need. The unusually cold weather seems to have affected the Indians and the Malaysians much more than others. “But you cannot offer the weather as an excuse since it applies to all the teams. Yes, to an extent, it did affect our performance, but it does not still explain the defeat,” said Lissek. From India’s point of view, the team did fall short on inspiration against Belgium. Their failure to control and dictate the flow of the game with clever ball rotation led to some disjointed play that was made to appear much worse than it actually was due to lack of focus and an effective gameplan. As Rajinder admitted, penalty corners continue to be a bogey area for India who converted just one of the seven they received against Belgium. Len Aiyappa, the specialist, had four tries and converted one, while other attempts — one each by Dilip Tirkey and Baljit Singh Dhillon — failed, and on another occasion, Gagan Ajit Singh could not even stop the ball at the top of the circle. The off-the-ball running by the forwards to create space was conspicuous by its absence and their tendency to bunch together led to confusion. Also, with the half-backs not up to speed in terms of ball distribution, the Indian moves were rather disjointed. After registering a comfortable 4-1 victory over the visitors in the first ‘Test’ here yesterday, the hosts found the going tough today. They took the lead in the 11th minute when defender Jitender Pal Singh, who played his heart out, hit home, off the second penalty corner, in the 11th minute (1-0). It was a tough contest thereafter as the Malaysians warmed up to make the Indian boys sweat out for ball possession. The pressure mounted by the Malaysian forwards finally told on the Indian defence which caved in to concede a series of penalty corners. Off the seventh, Jeevan Mohan powered the ball in (1-1), in the 14th minute of second half, to get the equaliser. The hosts were shaken out of their slumber when Malaysia took the lead in the 26th minute through P Prabhakaran, who had also scored their consolation goal yesterday. This setback surprisingly activated the Indian attack, and in the span of two minutes, the hosts mounted lightening moves down the left flank to slot in two goals in the space of two minutes, through Girish Pimpale and Birindra Lakra, in the 23rd and 24th minute, respectively to regain the lead (3-2). A minute before the final hooter, Jitender Pal Singh converted yet another penalty corner, to complete his brace and enhance India’s lead (4-2). If there was a ‘man of the match award’, it would have gone to the tall and tough-built Jitender Pal Singh, who not only scored two vital goals, but also prevented Malaysia from scoring a couple of sure goals off penalty corners. His rock-like defence baulked the marauding Malaysians who could convert only one of their seven penalty corners. India had better luck with penalty corners today as they made use of two of the four they earned, thanks to the sure shots of Jitender Pal Singh. Jitender put India in the lead when his carpet drive, off the second penalty corner, found the target. The Malaysian boys then stepped on the pedal to speed up the game, and for the first time, the Indian boys had the mortification of chasing the ball. Attack and counter attack became a norm, rather than an exception as was the case in the first ‘Test’, yesterday. Azli Misron and Sevaraju Sandraksi combined brilliantly to put the Indian defence under tremendous pressure. Both displayed tremendous speed, dribbling skills, ball control and perfect co-ordination. But the visitors failed to cash in on the four penalty corners they forced in the first session. The Indian defenders, rushing tactics helped in spoiling the rhythm of the Malaysians while taking penalty corners. Sandeep Singh was sent out to cool his heel, when he kept on jumping the whistle during penalty corner takes. Jivan Mohan finally succeeded in scoring off one, the seventh, to equalise while Prabhakaran put the visitors ahead with a fine field goal, following a free hit. India then charged in like wounded lions to raid the rival goal through the left corridor and scored the equaliser when Tushar Khandkar’s goal-ward shot was deflected in by Girish Pimpale. Tushar Khandkar also charted the course for the third goal with Birindera Lakra giving the finishing touches. Jitender Pal Singh produced the fourth goal, again off a penalty corner, with seconds remaining for the final hooter. The third ‘Test’ will be played here on Friday at 4 pm while the fourth Test will be played at Chandigarh on March 7 (Sunday). Sunil Kumar, lucky to be pitted against a lower-ranked compatriot and wild card Somdev Dev Varman, won in straight sets 6-4, 6-3, but national champion Vishal Uppal had to struggle hard to edge out another wild card Vijay Kannan 6-7 (3-7), 7-6 (7-4), 6-1 for a place in the last eight stage. Corps of Engineers rowed into the finals of all the events on the third day of the 24th Open National Rowing Championship at the Sukhna Lake today. Services men advanced into all finals except the light men's coxless fours as the final line-ups were completed. Chandigarh men put up a dismal show as they failed to figure in any finals. Dalip and Sukhbir managed to advance to the semifinals where they were edged out by Gyanenderpal Singh and Krishan Kumar of Delhi in the semifinals. 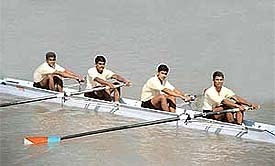 Delhi and Karnataka men will compete in two finals while Punjab will fight for top spot in the men's single sculls. 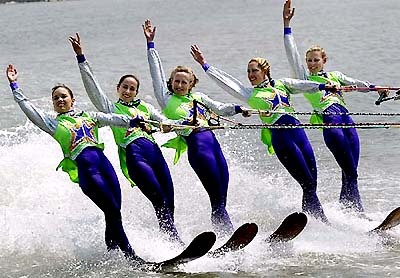 Hosts' expectations rest on their women rowers as Chandigarh compete with Orissa to wrest top honours in most events. The quartet of Gurpreet, Gurnoor, Sukhman and Saroj are likely to fetch the gold in the coxless fours event as it has only three participating team. Chandigarh were first in the time trial race. Punjab's Sunil Kumar will take on Nb Sub RK Pillai of Services and Parveen Kumar of Corps of Engineers in the men's singles sculls . In the women's section the competition will be between Sonali Ashok Gite of Maharashtra, who had a narrow win against Ng Tababi Devi of Manipur, Saroj Bala of Chandigarh and Pravasini Dwivedy of Orissa. Chandigarh and Orissa girls had made it to the finals yesterday. In the women's doubles sculls Chandigarh's Gurpreet and Gurnoor will row against Seema Uttam And Jincymol Varghese of Kerala and Pravasini Dwivedy and Mamata Jena of Orissa. The Chandigarh duo defeated the Kerala pair today in the semifinal. In the coxless pairs Orissa's Mamata Jena had teamed with Kabita Shyanti to enter the final yesterday. In the men's coxless pairs Services Spr Yousef R\Spr Shyju CM, Corps of Engineers Roshan Lal\ Rehman Mujeeb and Delhi's Gyanenderpal Singh\Krishan Kumar made it to the finals. In the men's coxless fours the Services quartet of Nb Sub Inderpal Singh, Hav Manoj Augustine, Hav Jagtar Singh and Spr Rajesh Kumar entered the final along with Delhi's Naresh kumar, Krishan Kumar, Ajay Kumar and Pradeep. Corps of Engineers team had moved into the final yesterday. Karnataka along with Corps of Engineers team advanced to the finals of the light men's doubles sculls and coxless fours. Services complete the line-up in the doubles sculls while Delhi are the third team in the coxless fours event. Women's doubles sculls: Kerala, Orissa and Chandigarh. In the evening match, Rail Coach Factory had to struggle hard to win the match against Eastern railway Kolkata by 1-0 to qualify in the quarterfinal. At half time both the teams were level0-0. The lone goal came from Manjinder Singh who converted the goal from a beautiful pass from Mohinderdeep in the 85th minute of play and led the team to victory. In the league matches played this morning, Southern Railway Chennai defeated North West Railway Jaipur by 3-1. Jebamani of Southern railway scored the third hat-trick of the championship by scoring three goals in a row in the 48th, 52nd and 73rd minute of the play. Yunus Ahmed of North West railway however reduced the margin for his team in the 86th minute with a beautiful goal. Grieviously injured Habeeb Khan and Vikas Thakur have been rushed to PGI Chandigarh. Those who had fracture of arms and ribs included Sajid Khan, Rajiv Gupta and Harish Sharma admitted to district hospital here stated to be out of danger, according to the hospital sources. They had gone their to witness open invitation cricket tournaments under progress at Luhnu ground. Resentment prevails among members of the District Bodybuilders Association over the recent decision of the Centre to impose 8 per cent service tax on all the health clubs in the country. Expressing concern over the decision, Mr Paramjit Singh Sekhon, president of the association, said this act of the government would cause a financial setback to institutions running in remote areas. He said such clubs had a meagre income and many of them had secured loans for the purchase of different equipment to run the clubs and would be unable to bear the burden. “If the decision is not reversed the associations in backward areas would launch a stir to protect the interests of youth running such institutions,” Mr Sekhon warned. In order to prepare the Punjab under-21 team for the under-21 National Football Championship to be held at Ambala from March 19 to 28, trials for selection of probables will be held at 10 a.m. on March 8 at the JCT football stadium, Phagwara. The probables should be born on or after January 1, 1983, according to a press note issued by Mr Inder Singh, secretary, Punjab Football Association. Palwinder Kaur of Government College for Girls has been declared the best athlete during the 50th annual sports meet of the college organised here today. The meet was inaugurated by Karnam Maleshwer, winner of Rajiv Gandhi Khel Rattan Award. Simranjit Kaur of B.A part III and Ramandeep Kaur of B.A part II bagged the first and second position respectively, in the high jump. In run and role race Neetu Dutt of B.A Part III and Palwinder Kaur of B.A II stood first and second, respectively. In 800 metres race Palwinder Kaur of BA II and Ramandeep of BA Part II bagged the first and second position, respectively. In discuss throw Gurpreet Kaur of BA part II and Manmeta of BA part II stood first and second position, respectively. In 3000 metres Baljit Kaur of BA part II and Randeep Kaur of BA part II stood first and second, respectively. In short put Gurpreet Kaur of BA II and Manmeta of BA part II stood first and second, respectively. In tug of war Sahib Kaur and Laxmi Devi bagged the first and second position, respectively. In 100 metres, Palwinder Kaur and Randeep Kaur bagged the first and second position, respectively. In duck walk, Palwinder Kaur and Rajwinder Kaur stood first and second, respectively. In the long jump Ramandeep Kaur and Palwinder Kaur bagged the first and second position, respectively. In 400 metres Palwinder Kaur and Simranjit Kaur stood first and second, respectively. NEW DELHI: Indian eves continued with their fine run in the World Team Table Tennis Championship at Doha, Qatar, jumping to the top spot in group E after registering a hard-fought 3-2 victory against Bulgaria. The Indians, playing in the 2nd division of the competition, remain in the hunt for promotion to the 1st division in the next edition of the championship, according to information received here on Wednesday. As per the new format of the tournament, the teams have been divided into five divisions, with the best 12 vying for honours in the Championship Division for the title while all others being placed in respective divisions on the basis of their rankings. India’s victory against Bulgaria last night follows win against Slovenia and a walk-over by Nigeria, meaning the women have maintained a cent-per-cent record after three matches. Result: India bt Bulgaria 3-2 (Poulami Ghatak beat K Gatinska 11-6, 11-7, 4-11, 8-11, 11-9; Mouma Das beat A Kasabova 12-10, 4-11, 13-11, 11-5; Anindita Chakraborty lost to D Petrova 10-12, 5-11, 4-11; Ghatak lost to Kasabova 11-13, 11-6, 8-11, 9-11; Das beat Gatinska 8-11, 12-10, 11-6, 11-6.